Progressive lawmakers have told President Obama he should unilaterally raise the minimum wage for federal contact employees, saying it would allow him to fulfill his promise of helping low-income earners without waiting for congressional action. Despite Obama’s recent push to increase the minimum wage across the nation’s entire workforce, the fate of such a measure in Congress remains uncertain. Reps. Keith Ellison, D-Minn., and Raul Grijalva, D-Ariz., co-chairmen of the Congressional Progressive Caucus, wrote Obama a letter Dec. 4 telling him to take the “bold step” of issuing an executive order that would increase the wages for workers on federal contracts. 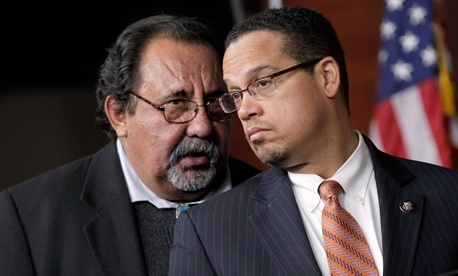 All told, Ellison and Grijalva said, the measure would affect more than 2 million employees. The minimum wage has become a hot topic in recent weeks, with both the president’s push and organized protests by low-wage workers across the country. Democrats have called for the nation’s lowest earners to make at least $10.10 per hour, a significant increase from the current minimum of $7.25. That initiative, however, is unlikely to pass the Republican-controlled House. While Obama supports raising the minimum wage generally, White House Press Secretary Jay Carney issued a lukewarm response when asked about the Progressive Caucus’ request. Stan Soloway, president of the Professional Services Council, told Government Executive any company “ought to pay a fair and reasonable wage,” but downplayed the potential impact of the proposed executive order. He added hourly wages for contracted employees are generally pre-determined by the Labor Department, and questioned whether the president would even have the legal authority to issue such an order. American Federation of Government Employees National President J. David Cox said Friday he supports the effort to raise the minimum wage nationally, adding some of his members make the minimum allowable income or just more than it, but did not offer a comment on the proposal to raise contractor pay specifically.